It was with great excitement that Alix and I arrived in Tunis. Tunis is the capital of Tunisia, located on the Mediterranean coast, just south of Sicily. We had finally made it to Africa after some 8 months travelling in South America. We had also arrived at the site of one of the most interesting places in the ancient world. Carthage, a thriving Mediterranean city in ancient times, is now a coastal suburb of metropolitan Tunis. Scattered between the refined whitewashed villas of the modern suburb are the ancient remains of both Punic and Roman Carthage. We spent two days exploring Carthage because we wanted to do it comprehensively and we wanted to go by foot, walking the pleasant suburban streets between the ruins. Each day, we caught the rattling old metro train to Carthage Hannibal train station where we disembarked to explore further on foot. Carthage was founded in 814 BC by Phoenician (‘Punic’ in Latin) colonists. The Phoenicians were seafaring traders who originated in the vicinity of modern Syria and are credited with the invention of the bireme (a galley with two banks of oars) and the world’s first real alphabet. Over the centuries, Carthage became rich and powerful owing to its favourable location - to cross from the Western to the Eastern Mediterranean you had to sail by Carthage, so it was in a prime location for trading opportunities. 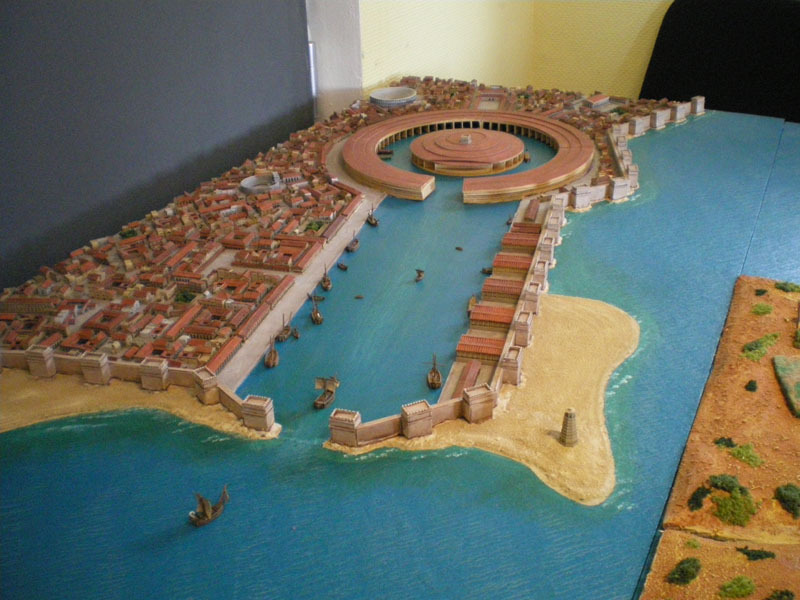 Unique in the ancient world, Punic Carthage had two distinctive harbours, a large circular naval harbour and a long rectangular commercial harbour. The naval harbour was the military pride of the Carthaginian empire, it could dock 190 ships on the outer ring of the harbour and another 30 at the shipyards on the inner ring, which would be used for repairing existing galleys or building new ones. By 265 BC, the Carthaginian empire had expanded through modern day Morocco and into Spain, absorbed the islands of Corsica and Sardinia, and founded cities and fortresses on the western half of Sicily. The emerging empire of Rome, which had recently consolidated its power on the Italian peninsula, did not like the strategic implications of Carthage controlling the strait between Sicily and Italy in the slightest, and the Sicilian flashpoint between Carthage and Rome sparked the three Punic wars. The clash between these two territorial and economic superpowers included some of the most awesome battles of the ancient world. The brilliant Carthaginian general, Hannibal, was a man well worth naming a train station after. A strategic and tactical warfare genius, Hannibal defeated Roman armies time and again in the battles of Trebia, Lake Trasimene and Cannae during his ten year long invasion of Italy in the Second Punic War. However, despite his abilities in the field, Carthage never supplied Hannibal with sufficient resources or manpower for him to attack Rome directly, which was perhaps the worst decision the Punic senate ever made. Hannibal’s victories were, for years, carefully studied by a young Roman General named Scipio Africanus, and unlike the Carthaginian equivalent, the Roman senate was willing to supply Scipio with the men and ships he needed to attack Carthage. Under attack by Scipio, Carthage recalled Hannibal from Italy to deal with the threat, but Scipio had studied Hannibal's playbook since his youth and it was not to end well for Carthage. At the Battle of Zama in 202 BC, Scipio Africanus defeated Hannibal's army and in the ensuing peace treaty, Punic Carthage forfeited most of its empire to Rome. After his defeat at the battle of Zama, Hannibal turned his attention to civic pursuits, and he oversaw the construction of residential villas on Byrsa Hill. The site at Byrsa Hill was once a Punic necropolis, then in the 7th century BC the necropolis was levelled and the area was used for metal workshops. At the time Hannibal and Scipio were duking it out, Byrsa Hill was almost certainly the location of the Punic main citadel and temple complex, but these structures were completely destroyed by the Romans prior to the area being used for Hannibal’s residential constructions. Today we can see the remains of the Punic Quarter of Carthage, which has been excavated from under the remains of a Roman Forum that was later built on top of it. This plaque is a rare example of the Phoenician alphabet from the 5th century BC. It is an inauguration plaque that was placed at an important intersection of the two main roads of Carthage at the time they were built. Most of the writing is people's names, thanking them for their work or funding towards the building of the road. It ends by saying that anyone who damages the plaque will be fined 1000 silver shekels - plus the cost of fixing the plaque. Carthage minded its own business for fifty years or so and went back to its practice of making enormous amounts of money trading on the Mediterranean. Under attack by their African neighbours, the encroaching Numidians, Carthage raised an army to defend itself. This act, in violation of its treaty with Rome, encouraged the Romans to attack Carthage again, and this time it was for keeps. Conquest runs pretty hot in the veins of the Scipio family, and Punic Carthage was completely destroyed by Scipio Aemilianus (Grandson of Africanus) in 146 BC. The Romans refounded Carthage, and it became an important Roman regional centre. Over time, the Romans developed a city with all the bells and whistles that Roman greatness demanded - a Forum for talking politics, several temples to honour various gods, public baths, a theatre for shows, an odeon for concerts, a hippodrome for racing chariots and an amphitheatre for watching Christians get thrown to the lions and other fun entertainments. The city was fed by an enormous system of aqueducts that piped water in from a springwater source over 120 kilometres away from the city. We had to use a bit of imagination to visualise most of these buildings today, but, walking from from site to site, we built a sense of Roman daily life as we wandered amongst the ruins. Far and away my favourite part of the ruins are the Antonine Baths, a massive recreational complex commissioned by Emperor Hadrian. The photo below shows a cross section of what the complex looked like, and you can see one of the impressive main columns that held up the roof in the background, and from the height of that column, form an idea of how big the baths were. Surrounded by gardens, the main roof housed the Frigidarium, a massive cold pool, flanked by two huge gymnasiums, change rooms, hot baths, steam baths, tepid baths, massage rooms and chill out areas where up to 4000 Carthaginians would spend their afternoons bathing, relaxing, exercising, playing ball games, or just hanging out in the gardens, talking, reading or reciting poetry. There was an entry fee to the baths, about the equivalent of ten cents, I'm told, and the complex would have been surrounded by market stalls selling food, drink, clothes, jewelry, and everything else anyone might want to buy during an afternoon of recreation. I love the idea of the Antonine Baths. The combination of social life, cleanliness and exercise, all conducted in a massive building that reminded everyone of their own culture's greatness at a price that just about everyone could afford. It is way cool. All good things come to an end, and eventually Roman Carthage was invaded successfully by the Vandals, who ruled for 100 years until they were thrown out by the Byzantines, who were in their turn ousted from Carthage by the armies of Islam in AD 698. The Muslims preferred their city further inland and they founded Tunis, destroying Carthage for the second time. During the middle ages the French King Louis IX invaded Carthage as part of the 8th Crusade. A devout Catholic, patron of the arts, and all-round holy kind of guy, Louis was venerated by the Catholic church as ‘Saint Louis’. Saint Louis’ army was destroyed by disease and Louis himself died in Carthage before he had the chance to assault Tunis itself. In commemoration of his life and death, a Cathedral was built in his honour in 1890 on Byrsa Hill, and although it is not used for worship today, it still stands as a monument to the dead Christian saint. What are we to learn from all this history? I’m not sure. But I know that I like it. I like the fact that tucked away at the bottom of a hill, under the mosque that has been built on top of it, the Roman theatre is used every year for the Carthage International Festival, and local bands like ‘Rap Tunisien’ now play shows here, thousands of years after the venue was first constructed. I like the way the old and broken parts of Roman statues are used to beautify the signs that direct you to where the bathrooms are. I especially like that there are very few tourists here, and the locals go about their daily lives around you. You can sit for a few moments, quietly. When you do so, you can almost hear the echoes of the past, intermixed with the noise of the present. Alix stands in the orchestra of the ancient theatre. The scaffolding is a recent addition. Coming to an ancient Roman outdoor venue near you! Do NOT splash your sandals. Looks like an awesome trip! Tunisia and Carthage are on my list of places to go. Happy travels!